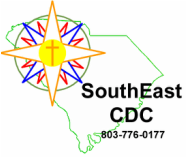 SouthEast Child Development Center - Welcome! WE ARE LOOKING FOR A COOK - CLICK HERE TO SEE MORE! We are a unique, full service child development center in southeast Columbia, SC serving children from age 6 weeks to 5th grade. We open at 6:45AM and close at 6:00PM Monday to Friday. Click a button below to learn more about our program for your child. Contact us for information about how to register your child or to schedule a tour!